Ernest R. Pecenka was born on 3 December 1922 at South Dakota. He was the son of Joseph Bartholomew Pecenka and Cecelia Smrt. Ernest R. Pecenka died on 22 January 1945 at age 22. [S250] U.S. Federal Census 1930 U.S. Federal Census, by Ancestry.com, ED68-5. Dwelling 53. Christian Bierle was born in March 1851 at Russia. He married Charlotte Mueller circa 1873 at Russia. Christian Bierle died on 31 May 1920 at age 69. Christian Bierle and Charlotte Mueller immigrated in 1875. [S246] U.S. Federal Census 1880 U.S. Federal Census, by Ancestry.com, NA Film Number T9-0115 Page Number 523A. [S245] U.S. Federal Census 1900 U.S. Federal Census, by Ancestry.com, ED355. Dwelling 89. [S244] U.S. Federal Census 1910 U.S. Federal Census, by Ancestry.com, ED449. Dwelling 27. [S243] U.S. Federal Census 1920 U.S. Federal Census, by Ancestry.com, ED264. Dwelling 70. Married Name circa 1873 As of circa 1873,her married name was Bierle. Charlotte Mueller was born in March 1851 at Russia. She married Christian Bierle circa 1873 at Russia. Charlotte Mueller died on 28 January 1931 at age 79. Charlotte Mueller and Christian Bierle immigrated in 1875. Charlotte Mueller had 8 with 6 living in 1900 children. Jacob H. Bierle was born in November 1878 at South Dakota. He was the son of Christian Bierle and Charlotte Mueller. Jacob H. Bierle married Mary E. Pike, daughter of George Pike and Martha (? ), circa 1901. [S244] U.S. Federal Census 1910 U.S. Federal Census, by Ancestry.com, ED449. Dwelling 25. [S243] U.S. Federal Census 1920 U.S. Federal Census, by Ancestry.com, ED264. Dwelling 39. William Bierle married Emma K. Huber, daughter of Frank Huber and Hedwig Rudolph, on 26 November 1912 at Yankton, South Dakota. William Bierle died on 7 August 1956 at age 72. Name Variation Lydia Bierle was also known as Liddia. Married Name 19 February 1907 As of 19 February 1907,her married name was Schenkel. Lydia Bierle was born on 12 July 1887 at South Dakota also reported as Jul 1888. She was the daughter of Christian Bierle and Charlotte Mueller. Lydia Bierle married David Schenkel, son of Christian Jacob Schenkel and Margaret Marie Ring, on 19 February 1907. [S250] U.S. Federal Census 1930 U.S. Federal Census, by Ancestry.com, ED28. Dwelling 35. Name Variation Paulina Helena Bierle was also known as Helena. Name Variation Paulina Helena Bierle was also known as Lena. Married Name 20 September 1910 As of 20 September 1910,her married name was Mueller. Paulina Helena Bierle was born in April 1891 at South Dakota. Paulina Helena Bierle married Albert W. Mueller, son of William Mueller and Fredericka (? ), on 20 September 1910 at Yankton, South Dakota, his surname listed as Muetler. [S243] U.S. Federal Census 1920 U.S. Federal Census, by Ancestry.com, Year: 1920; Census Place: Odessa, Yankton, South Dakota; Roll: T625_1726; Page: 3B; Enumeration District: 256; Image: 730. [S250] U.S. Federal Census 1930 U.S. Federal Census, by Ancestry.com, Year: 1930; Census Place: Township 96, Yankton, South Dakota; Roll: 2232; Page: 2A; Enumeration District: 28; Image: 1029.0. Name Variation Maria Ann Juergens was also known as Mary. Married Name 24 April 1873 As of 24 April 1873,her married name was Braunesreither. Maria Ann Juergens was born on 25 September 1852 at Illinois. She was the daughter of Phillip Juergens and Christina Peppler. Maria Ann Juergens married August Braunesreither, son of John H. Braunesreither and Johanna Lange, on 24 April 1873 at Monroe, Illinois. Maria Ann Juergens had 10 with 7 living in 1900 children. [S246] U.S. Federal Census 1880 U.S. Federal Census, by Ancestry.com, NA Film Number T9-0115 Page Number 517A. ED110. Dwelling 69. [S245] U.S. Federal Census 1900 U.S. Federal Census, by Ancestry.com, Dwelling 91. John Braunesreither was born circa 1875 at Illinois. He was the son of August Braunesreither and Maria Ann Juergens. Name Variation Godheart W. Braunesreither was also known as Hardy W.
Name Variation Godheart W. Braunesreither was also known as John W.
Name Variation Godheart W. Braunesreither was also known as Gothard. Godheart W. Braunesreither was born in November 1876 at South Dakota. Godheart W. Braunesreither married Caroline Schenk on 19 January 1910 at Menno, Hutchinson, South Dakota. [S243] U.S. Federal Census 1920 U.S. Federal Census, by Ancestry.com, ED264. Dwelling 25. [S250] U.S. Federal Census 1930 U.S. Federal Census, by Ancestry.com, ED68-27. Dwelling 40. Name Variation Andreas Joseph Braunesreither was also known as Andrew John. Name Variation Andreas Joseph Braunesreither was also known as Andy. Name Variation Andreas Joseph Braunesreither was also known as Andrew Joseph. Andreas Joseph Braunesreither was born on 18 November 1879 at South Dakota. Andreas Joseph Braunesreither married Margarethe Barbara Valentine on 2 June 1909 at Monroe, Illinois. Andreas Joseph Braunesreither died on 30 October 1962 at age 82. 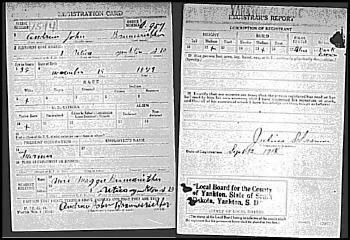 On 12 September 1918 at Utica, Yankton, South Dakota, World War I Draft Registration. [S243] U.S. Federal Census 1920 U.S. Federal Census, by Ancestry.com, ED263. Dwelling 76. Married Name 12 February 1901 As of 12 February 1901,her married name was DeJong. Elizabeth Braunesreither was born in December 1881 at South Dakota. She was the daughter of August Braunesreither and Maria Ann Juergens. Elizabeth Braunesreither married Bert DeJong on 12 February 1901 at Utica, South Dakota. Annie Braunesreither was born in July 1884 at South Dakota. Katherine Braunesreither was born in February 1888 at South Dakota. Albert G. Braunesreither was born on 26 January 1890 at Utica, Central Township, Yankton, South Dakota. Albert G. Braunesreither married Celia M. Volmer, daughter of Herman Volmer Sr. and Mary A. Hilgenhold, on 25 September 1917 at Catholic Church, Lesterville, Yankton, South Dakota. Albert G. Braunesreither died on 8 December 1969 at Yankton, Yankton, South Dakota, at age 79. Albert G. Braunesreither obtained US Social Security Card at South Dakota. [S243] U.S. Federal Census 1920 U.S. Federal Census, by Ancestry.com, ED264. Dwelling 20. [S250] U.S. Federal Census 1930 U.S. Federal Census, by Ancestry.com, ED68-27. Dwelling 42. George Bierle was born circa 1874 at Russia. George Bierle married Katherine Schempp circa 1897. George Bierle immigrated with Christian Bierle and Charlotte Mueller in 1875. [S244] U.S. Federal Census 1910 U.S. Federal Census, by Ancestry.com, ED438. Dwelling 4. [S243] U.S. Federal Census 1920 U.S. Federal Census, by Ancestry.com, ED257. Dwelling 32. [S9] South Dakota, South Dakota Birth Records South Dakota, File Date: August 30, 1941 (unknown file date). [S9] South Dakota, South Dakota Birth Records South Dakota, File Date: May 02, 1962 (unknown file date). [S9] South Dakota, South Dakota Birth Records South Dakota, State File Number: 556321 (unknown file date). [S9] South Dakota, South Dakota Birth Records South Dakota, State File Number: 797484 (unknown file date). Jakobine Bierle was born circa 1876 at Dakota Territory. Tom MacLeod was born on 2 March 1900 at Canada. He married Margaret Bigford, daughter of John Wesley Bigford and Margaret Anne Carlin, in 1965 at Spences Bridge, British Columbia, Canada. Tom MacLeod died on 12 June 1980 at Canada at age 80. John Wesley Bigford married Margaret Anne Carlin. Married Name Her married name was Bigford. Margaret Anne Carlin married John Wesley Bigford. Married Name 27 June 1943 As of 27 June 1943,her married name was Hyland. Margaret Grace McClain was born on 8 May 1924 at Swift Current, Saskatchewan, Canada. She was the daughter of John Edward McClain and Margaret Bigford. Margaret Grace McClain married Frank Ernest Hyland, son of George Robert Hyland and Lillian Edith Thresher, on 27 June 1943 at Swift Current, Saskatchewan, Canada. Margaret Grace McClain died on 15 July 1995 at Surrey, British Columbia, Canada, at age 71. Frank Ernest Hyland was born on 16 December 1919 at Surrey, England. He was the son of George Robert Hyland and Lillian Edith Thresher. Frank Ernest Hyland married Margaret Grace McClain, daughter of John Edward McClain and Margaret Bigford, on 27 June 1943 at Swift Current, Saskatchewan, Canada. Frank Ernest Hyland died on 23 February 1996 at Surrey, British Columbia, Canada, at age 76. William Roy Sawyer was born on 10 August 1911 at Armstrong, British Columbia, Canada. He was the son of William Sawyer and Charlotte Holtby. William Roy Sawyer died on 12 September 1981 at Burnaby, British Columbia, Canada, at age 70. Married Name 14 May 1950 As of 14 May 1950,her married name was Cyr. Velma Claudia McClain was born on 7 February 1928 at Swift Current, Saskatchewan, Canada. Velma Claudia McClain married Kenneth Lawrence Cyr on 14 May 1950. Velma Claudia McClain died on 17 September 1994 at Maple Ridge, British Columbia, Canada, at age 66. She was buried after 17 September 1994 at Maple Ridge Cemetery, Maple Ridge, Greater Vancouver Regional District, British Columbia, Canada. Kenneth Lawrence Cyr was buried at Maple Ridge Cemetery, Maple Ridge, Greater Vancouver Regional District, British Columbia, Canada. He was born in 1926. He married Velma Claudia McClain, daughter of John Edward McClain and Margaret Bigford, on 14 May 1950. Kenneth Lawrence Cyr died in 2001. Married Name 28 June 1952 As of 28 June 1952,her married name was Eheler. Florence Adeline McClain was born on 12 April 1932 at Swift Current, Saskatchewan, Canada. Florence Adeline McClain married Harold Eheler, son of Archibald Eheler and Elizabeth Moorman, on 28 June 1952 at Vancouver, B.C., Canada. Florence Adeline McClain died on 23 May 1998 at Chilliwack, British Columbia, Canada, at age 66. Harold Eheler was born on 6 May 1928 at Melfort, Saskatchewan, Canada. He was the son of Archibald Eheler and Elizabeth Moorman. Harold Eheler married Florence Adeline McClain, daughter of John Edward McClain and Margaret Bigford, on 28 June 1952 at Vancouver, B.C., Canada. Harold Eheler died on 28 November 1990 at Revelstoke, British Columbia, Canada, at age 62. George Robert Hyland married Lillian Edith Thresher. Married Name Her married name was Hyland. Lillian Edith Thresher married George Robert Hyland. William Sawyer married Charlotte Holtby.